Townsville is one of the most densely populated and most visited cities in Northern Queensland, as characterized by sun and warmth for about 300 days a year. If you are travelling by a van/car where to sleep in, you can easily stay for free in a BP fuel station just 7 km far from the city centre. Better get there before 8 pm because it is always full of backpackers. It's not exactly the best place where you can stay in, but it is perfect to save some money and sleep near the centre. It has free toilets and hot showers for 5 AUD (we usually prefer the cold ones for free at the beach). 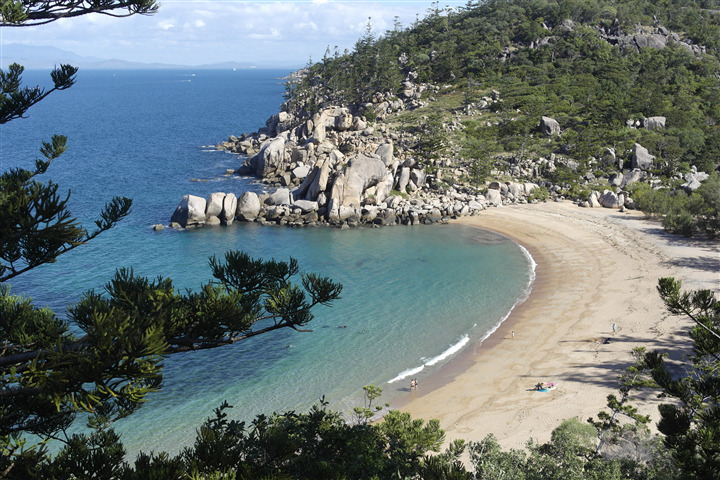 Townsville is just 25 min away by ferry from a wonderful island: Magnetic Island (also called Maggie). We highly recommend a one or two-day visit. The latter is indeed an island surrounded by tropical vegetation overlooking wild, beautiful and peaceful beaches. It can be reached by ferry from Townsville for the price of 39 AUD round-trip, which also includes the daily bus ticket within the island. The price for carrying your car on the ferry is of 165 AUD round-trip. Therefore, it isn’t worth it for us. Once on the island, we take the bus to Horseshoe Bay, the northern beach where we also find a really nice Sunday Market. From here we walk for about 1 hour to reach Radical Bay. The route is full of upward and downhill steps that finally end into a crystal clear ocean. After a relaxing break under the sun, we keep walking through the beautiful beaches of Gowrie and Florence Bay, where we can admire a lush vegetation blending with the blue ocean. We then take the bus from Arthur Bay to get to the most southern beach - Picnic Bay- and finally return to Nelly Bay where to get the ferry back to Townsville. It has been a perfect day of trekking, relax and wild landscapes. In short, Townsville will surprise you for its fascinating beauty and for the several activities available both in the city and in its surroundings. Undoubtedly a town full of colours and good vibes, perfect for any backpackers coming through.